“The bottom line is the same bottom line for the last eighty-plus years: this Fort Harrison is and will always remain a landmark and home for all of Clearwater,” said Mr. David Miscavige, ecclesiastical leader of the Scientology religion, before cutting the ribbon for the restored landmark. The Fort Harrison Grand Lobby, long a crossroads for the Clearwater community, was fully restored to an elegance far exceeding its opening day in 1926. The Grand Lobby of the Fort Harrison religious retreat, welcoming parishioners and guests alike to the restored splendor of this Gulf Coast jewel. The Fort Harrison’s Hibiscus Restaurant provides world-class dining for parishioners at the Scientology religious retreat. The Garden Restaurant, with its casual tropical motif and view of the Fort Harrison’s emerald garden and pool, provides the ideal setting for parishioners on break from training or counseling. The Fort Harrison features a variety of accommodations for parishioners from around the world who come to Scientology’s spiritual headquarters in Clearwater, Florida. Suites in the Fort Harrison provide world-class accommodation and services for parishioners and their families. The Fort Harrison’s Presidential Suite provides parishioners with comfort and accommodation in the grand tradition of Southern hospitality. The Fort Harrison’s auditorium serves as the site for international Scientology events, summits and seminars, while also hosting events for nonprofit organizations in the Clearwater community. The Fort Harrison’s Crystal Ballroom, where in earlier decades Duke Ellington, Count Basie and other legendary performers headlined, now stands fully restored to its original gold-leaf splendor. The Fort Harrison at the center of downtown Clearwater, Florida, has served as a hub for the community since the 1920’s. While providing accommodations, restaurants and amenities to Scientologists taking religious services, it also continues to serve the community for special events. Fully restored in 2009 along with the main structure, the Fort Harrison’s pool and pavilion allow parishioners to relax in an ideal setting between religious services. 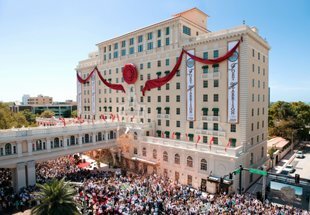 More than 6,000 Scientologists from over 50 nations filled the streets and sidewalks at the 200 block of Fort Harrison Avenue on March 14, 2009, as Chairman of the Board of Religious Technology Center, Mr. David Miscavige, officiated at the ribbon cutting of the Clearwater, Florida landmark—the new Fort Harrison. 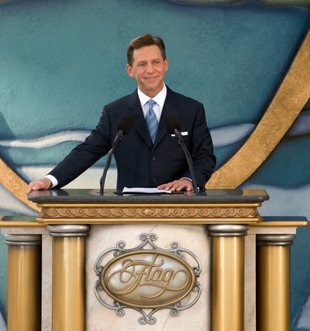 "Her bones were good, her breeding impeccable and her choice of residence couldn't have been more fitting: Clearwater, Florida," began Mr. Miscavige as he addressed those assembled. "When she originally opened in 1926, they called her 'the aristocrat of southern Florida hotels' and described her as a 'picturesque edifice' known all up and down the coast, as the toast of this city and an ever-bustling hub of wedding receptions, fashion shows, bridge teas and Rotary Club functions. "She additionally saw no inconsiderable parade of luminaries. In the '60s and '70s the Phillies used to stay here during spring training and Duke Ellington, Count Basie and Buddy Rich all performed in our ballroom." "The bottom line is the same bottom line for the last 80-plus years: this Fort Harrison is and will always remain a landmark and home for all of Clearwater." And with that, he cut the 2,00-foot-long red ribbon and so ushered in a new beginning for the "Grand Dame of the West Gulf Coast." The grand opening of the new Fort Harrison religious retreat was the culmination of an 11-month, million-man-hour restoration. All 267,000 square feet of the 83-year-old structure were stripped down to bare beams and rebuilt from the inside out. The 21st-century infrastructure eased into her 1920s framework, with every one of the 200 guest rooms rebuilt from floor to ceiling and energy-efficient, low-emission electrical and mechanical systems throughout. More than 350 local tradespeople worked on the project, ultimately laying 100,000 square feet of carpet, installing 300,000 feet of plumbing and stringing a full 100 miles of electrical wire. Restoration of the building's hallmark features began in the elegant Grand Lobby, from the original wrought-iron and brass balustrades to the signature checkerboard marble floor and gold-leafed Corinthian columns. And high atop the Fort Harrison, the legendary Crystal Ballroom also underwent complete restoration to well beyond its original beauty. The Fort Harrison has served as a hub for this community since the 1920s and continues to do so today. In addition to the Scientologists who avail themselves of the religious retreat's accommodations, restaurants and amenities while in Clearwater for religious services, the community at large also enjoys the Fort Harrison. Hundreds from across Tampa Bay gather for Open House brunches and community events, such as the Sunscreen Film Festival “Broadway and Beyond” concert, Harlem Nights Jazz Festival and other benefits for the arts. Couple that with the dozen or more interested people who simply walk in every day for a tour—and it is clear the Fort Harrison is, as it has always been, a home for Clearwater.